While annoying I’ve found a lot of sites accept something like DUB 001 as a postcode. While I can’t remember what I exactly used, I do have a flickr account so I’m guessing it worked! A while back I was trying to purchase an item online from the US and the order process insisted on a postcode so I used one from Berlin where I stayed for a while as it was the only postcode that I knew off the top of my head, thinking it didn’t matter as the address said Ireland. A lot of sites accept na or n/a for postcode. That’s probably what I used when I signed up. DUB 001 and NA don’t work either. N/A does seem to work though – bloody crazy that they enforce and try to validate postcodes on a country which doesn’t have postcodes. I often put in 90210 when forms are particularly sticky about postal codes. But yes – it can be tricky when ordering something online! 90210 wouldn’t work in this case (unless you changed your country to the US). Nothing would. Except N/A – forgot to say thanks to Aidan for that suggestion earlier. I had the same trouble. I just put in a US Zip code in Chicago and then after the account was activated I changed the address back to Ireland on the account settings. Though it still gives me the weather for Chicago on the Yahoo! homepage. Drives me nuts. Spreadshirt insist on a postal code when ordering t-shirts as well – now at least you can put anything you like in, but still, people who work with computers will chance anything – but there would be a percentage of people who would be put off by a required field on a commercial site that they were unsure about. Not exactly confidence inspiring during a purchase process. Here’s a workaround, first signup for a Yahoomail account, with all correct Ireland data, then use the Yahoo Id to signup to Flickr. The arrogance of yahoo is nothing new. They are already insensitive to the whole John Bulls other island thing in that they brand their product Yahoo UK/Ireland. I call this type of insensitivity Regionalisation and it manifests itself when a UK company ( for simplicity and fiscal alacrity ) treats Ireland as a region of the UK. We see it in advertisements, product placement and indeed addressing. This of course leads to many difficulties not least the fact that if you are not happy with service or indeed wish to sue them you have to chase it down through the English legal system. A very good example of this is MBNA and their credit cards and financial products. The whole business is ran through the UK and is passed onto the Irish consumer by Irish companies who then refer complaints and difficulties onto the help lines or solicitors in the UK. Try Tesco, Debenhams, British Telecom etc etc. My answer is simply not to purchase from these companies or in the case of Yahoo not to use their services. I accept that the reality that most companies that sell into Ireland are multinationals etc but I refuse to buy from anyone who does not make an effort. I just spent 15 minuts trying to create a flickr account, and sure enough, almost three months later, they still haven’t fixed this problem. I had the same problem trying to create an Irish yahoo mail account. Finally, after trying n/a, null, *** and all the usual, a dash worked. So just enter – for your Irish post code. On the Flickr registration page, in the top right hand corner is the line “I prefer content from”, with an attached drop down list, choose Yahoo!Ireland and it will accept “Dublin 4” as postal code. I got it done 5 minutes ago. First choice content yahoo.ie than all details and than the country as UK and put any UK postal code, i e. TR14 8SR. Thank you Audrey Drumm! By far the best/quickest solution, without having to select country of residence as UK/US first. I had tried literally everything, and the “Yahoo Answers” page contains a WRONG answer which doesn’t help matters. I asked yahoo how to do it and they sent me that link. I have tried and its work. So everybody who want sign up at yahoo.ie, enjoy ! In field postal code please type “not available”. Hi folks! Thnks a lot Slavco for smart advise! I was strugling the same way- no chance to register without postcode, even though I’ve tried many options. Finally did as you’ve recommended with UK residence first and it was accepted! I just wonder why is everything upside down in Ireland- no matter what you do:))? Just type a full stop, that’ll work. 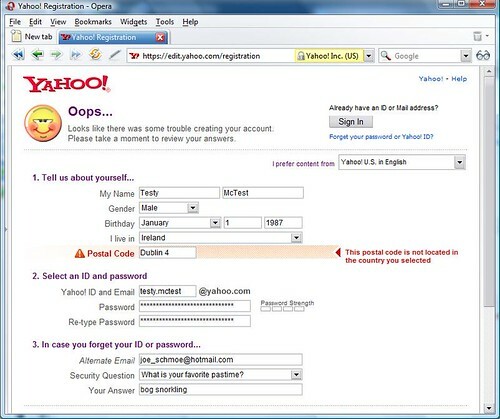 I had an old Yahoo ID but I’ve forgotten the password and they couldn’t mail it to me either. Pathetic. Thanks Audrey Drumm. Just a dash – will do for postcode. for the postcode put 90210 and your home country as united states then it will set u up on it… go to your account settings and change yourself back to being proud to be irish!! thanks..
quick fix for a very irritating problem. Most forms accept ***** as postcode. I think that’s what I used for yahoo/flickr. Eoin, Dublin has postal districts, not postcodes. I understand that Yahoo! has done the same for New Zealand – you get a yahoo.com.au instead of yahoo.co.nz, in spite of the fact that NZ has never even been part of Australia – it decided against joining it in the first place. It’s only just got postcodes though. Oh, and East Timor has been independent since 2002, but a lot of organisations still haven’t updated their records, even though it’s now the world’s third newest country after Kosovo and Montenegro. Some of the offenders are Irish, sorry to say. It’s not just Ireland! I live in Portsmouth in England, and they won’t validate my very real postcode either. When I try to enter my postcode in Malaysia [where I stay], Yahoo says it does not exist. Then I tried it with other different cities that I know and they do not exist either. Apparently I am living off the planet Earth. ijo musta ka na?mis u!sory sa nkaraang gabi di tayo nagkaintindihan.nway just take care ,luv u!